Whole mung beans are small round beans with a bright green skin and a yellowish color on the inside. They are a very versatile and highly nutritious legume, popular in many Indian dishes and easily adaptable to an array of dishes from hummus to veggie mung-burgers and even mung-beet marinara sauce. A notable advantage of mung beans is that they are easier to digest than chick peas. Mung beans are native to India, then spread to China, Southeast Asia, and eventually made their way to the United States where they are mostly grown in the southern states such as Oklahoma. They require temperatures between 80° to 90°F, and can handle drought like conditions. They are incredibly rich in B vitamins! Vitamin B1, is required for critical neuronal functions. Vitamin B2 or riboflavin is vital for healthy eyes and skin. Vitamin B3 or niacin regulates cholesterol and blood sugar levels in the body. Vitamin B6 is necessary for the production of the neurotransmitter serotonin, which is active in mood regulation. Vitamin B9, also known as folate or folic acid, is required for production of red blood cells and is thus important for regulating the oxygen carrying-capacity of the blood and also reduces the risk of heart disease. Vitamin C is required for healing immune system, to fight against infections. Minerals: Mung beans are also a treasure house of minerals including calcium, iron, magnesium, potassium, phosphorus and copper. These mineral, are vital for everyday functions of the body and maintaining homeostasis or equilibrium and help prevent heart disease, anemia, diabetes and renal (kidney) problems. Mung beans are also a good source of dietary fiber and contain very few oligosaccharides, the long chain sugars which can be the cause of flatulence, and are therefore highly suitable for children or those with delicate digestive system. 1. Mung beans has been strongly associated with a reduced risk of heart disease and healthy cholesterol levels. 2. Mung beans Khichari (thinner in consistency) is given anyone recuperating from acute or chronic health conditions. Learn more about Khichari from my previous blog post. 3. 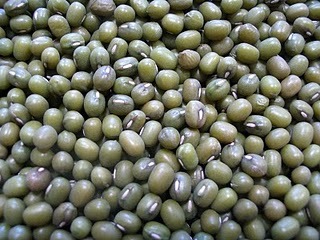 The fiber in mung beans is great in supporting colon health by improving bowel function and cleansing the intestines. 4. Mung beans provides slow releasing carbohydrates that give sustained energy for those suffering from low energy or with blood sugar imbalance. 5. Mung beans are excellent source of energy especially for vegetarians. When cooked with digestive spices mung beans not to aggravate the Vata Dosha. 2. Drain water after soaking and rinse once. 3. Get all the spices ready and set them aside. For example, get all the dry spices in a bowl; mince garlic, ginger and cilantro leaves. 4. In a soup pots put the mung dal and water; and bring it to a boil. Add turmeric, kokum and salt. Cook on a medium-high heat for 25 minutes without covering the pot. Stir occasionally to prevent sticking. 5. Add more water if needed. In a pressure cooker the mung dal will take 20-25 minutes to cook however in a regular soup pot it may take up to 40 minutes to cook. 6. Once dal is cooking, turn off the heat and using a hand held blender - blend the soup to a smooth consistency. Set the soup aside. 7. For Tempering: Heat ghee or sunflower oil in a small saucepan until the oil becomes medium hot. 8. Add cumin seeds, mustard seeds, and hing. When the seeds start to pop turn down the heat and add ginger, garlic, curry leaves, cilantro leaves, bay leaf, and garam masala powder. For more Ayurvedic recipes and a complete course of Ayurveda visit: http://ayurvediccookingclass.com/ A certified Ayurvedic Culinary and Nutrition Program for Optimal Health. Making some this week as a side dish to help with digestion.